Handheld Nautiz X1 Windows or Android ultra-rugged, ultra-compact handheld Mobile Computer - Nautiz X1 is an ultra-rugged handheld that runs either Android 4.0 (Ice Cream Sandwich) or Windows Embedded Handheld 6.5 operating system. The 4-inch, 800x480 WVGA capacitive touchscreen is sunlight-readable and scratch-resistant. Standard accessories include: Standard and extended capacity battery(including back cover), AC charger, USB data cable, quick start guide. 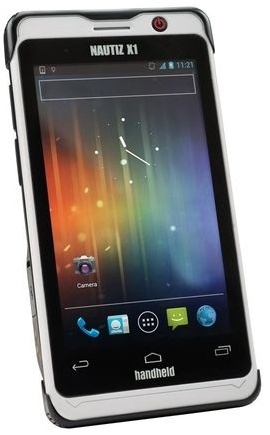 Android 4.0 (Ice Cream Sandwich) or Windows Embedded Handheld 6.5 operating system and meets stringent MIL-STD-810G military standards for withstanding humidity, vibration, drops and extreme temperatures. And with an IP67 rating, the Nautiz X1 is fully waterproof and impervious to dust and sand. The device includes the 5 mega pixel camera on the rear side allows to record the 720p HD video recording and take pictures at splendid quality. It features Wi Fi 802.11 a/b/g/n/ along with the option of Wi Fi tether, Bluetooth tether. The auto focus and LED flash option enhances the camera capabilities. For navigation it includes u-blox GPS (EGNOS/WAAS capable), G-Sensor, E-Compass features. It includes the 1530 mAh Li Ion as standard and also includes the 2920 mAh Li-ion optional battery to provide the full day’s work under any conditions. With the Nautiz X1, you don’t have to choose between dependability and slim design. With its small size and light weight of only 180 grams (6.3 ounces), it’s among the smallest enterprise handhelds. Built for the toughest conditions, the Nautiz X1 meets stringent MIL-STD-810G military standards for withstanding humidity, vibration, drops and extreme temperatures. And with an IP67 rating, the Nautiz X1 is fully waterproof and impervious to dust and sand. The Nautiz X1 also offers high-speed data transmission worldwide over GSM networks, and connects to 802.11 b/g/n WiFi networks. Both a standard 1530 mAh Li-Ion battery and a 3060 mAh extended battery come with the Nautiz X1, giving you options for choosing which configuration works best for you. And when you’re out in the world, embedded GPS, E-compass and G-Sensor keep you on the right track. Plug into a 3.5-millimeter mic/earphone jack, or pair the Nautiz X1 with a your BT peripherals. Plus, the Nautiz X1 has a multitude of optional accessories, including a desktop cradle, an extended battery, a vehicle cradle and carry cases. If you need an ultra-compact and powerful handheld that can satisfy your demands for tough field work, don’t limit yourself to just a regular mobile device — choose the Nautiz X1 for an ultra-rugged tool that keeps your data safe no matter what. Nautiz X1 is the perfect combination of the smart phone with rugged features. Nautiz X1 smart phone is made keeping the military standards in mind and it endures water droplets, sudden drop from hands, humidity, extreme hot and cold temperatures to an extent. It can be immersed into 1 meter water for 30 minutes and still can work perfectly, thus receiving the IP 67 certification. These certifications also specifics that the device is very well protected against the dust while you are working near a construction site or you are in agricultural field. Handheld group a Sweden based manufacturer have come up with the launch of Nautiz X1 which is not just an smart phone but its tougher, infact it’s the toughest smart phone as claimed by the manufacturers. Several smart phone like Sony Xperia Go, Samsung Galaxy Xcover, or Motorola Defy Pro have received IP67 certifications but only this smart phone receives upper hand that those. Nautiz X1 meets MIL STD 810G military standards. These standards are maintained by US Army and US Navy and it addresses to a broad range of environmental conditions which also includes low pressure, high & low temperatures, shocks, freezing & windblown rain, extreme humidity, fungus, dust exposure, gunfire vibrations and random vibrations. It can work perfectly at an altitude of 4500 meters at 23 degrees as well. Well that was all about the external properties of the device her and going through its specifications it runs on the Android 4.0 Ice Cream Sandwich OS or Windows Embedded Handheld 6.5. It sports 4 inches WVGA display screen providing a maximum resolution of 800 x 480 pixels with capacitive touch. It has a damage resistant glass and the screen is sunlight readable as well thanks to its better brightness capacity. It’s powered with 1 Ghz Texas Instruments OMAP dual core processor and includes the 512 MB of RAM which notches up the best performance in the field. It includes the 2 GB of internal memory storage capacity alongside with a micro SD card support providing 32 GB storage.Handheld Nautix X1. The device includes the 5 mega pixel camera on the rear side allows to record the 720p HD video recording and take pictures at splendid quality. It features Wi Fi 802.11 a/b/g/n/ along with the option of Wi Fi tether, Bluetooth tether. The auto focus and LED flash option enhances the camera capabilities. For navigation it includes u-blox GPS (EGNOS/WAAS capable), G-Sensor, E-Compass features. It includes the 1530mAh Li Ion as standard and also includes the 2920 mAh Li-ion optional battery to provide the full day’s work under any conditions. Handheld Nautiz X1 1 Slot Standard Cradle, Charger and USB Cable Included.